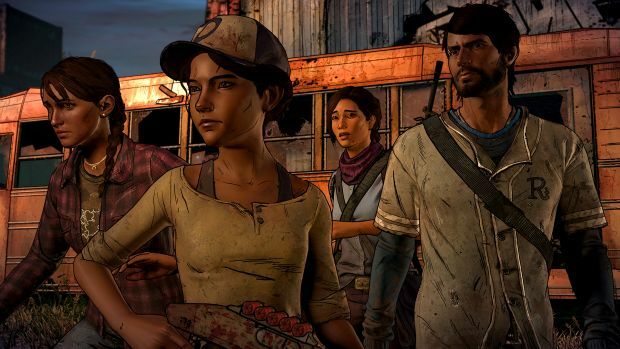 The first season of Telltale’s The Walking Dead not only made the studio a household name, but arguably transformed the adventure game genre as a whole, bringing back the mostly-dead genre with an emphasis on story and decisions over puzzles. Despite this, the second season wasn’t quite as well-received, with less meaningful choices and more senseless tragedy without any likable characters or reason for emotional involvement. Luckily, The Ties that Bind Part One, the first episode of the third season, titled “A New Frontier” is a strong return to form, with both old and new characters bringing fresh ideas to the table, while proving the franchise isn’t a shambling corpse just yet. The first two seasons focused on Clementine, a young girl forced to grow up during the apocalypse, but this season switches the focus of the story to newcomer Javier, a former professional baseball player who’s taken over as the head of his brother’s family after (as of this first episode) unexplained reasons. While Clementine is still playable in a brief flashback sequence, she’s more of a secondary character here, as players will spend the majority of the game controlling Javier. While I can see some players being turned off by playing as a previously unknown character for most of the game, I found he brought a much-needed fresh perspective to the series. Javier’s character arc, which the game’s first ten minutes do a great job of establishing, is about family, a theme that probably wouldn’t work with any returning characters at the helm. Luckily for our heroes, first impressions aren’t everything. The majority of this episode focuses on an unlikely alliance between Javier and Clementine, and the two really do make for an interesting, if diametrically opposed team. Javier’s a man with a family to take care of, and in most situations he comes across as more polite and soft spoken than the previous playable characters. Javier’s much more optimistic than Clementine; by the time we first see her in this episode, she’s become ruthless and pragmatic, though make the right choices and she and Javier will reach a steady, trusting alliance in no time. On the whole, both serve as great foils to one another, and the amazing voice acting from all the leads, with Melissa Hutchinson continuing to steal the show with Clementine and Danny Ramirez bringing a more subdued but earnest performance really helps to set the tone of the episode. I can’t wait to see more of their adventures. Overall, the focus on Javier and his family is a great solution to one of the main problems of Season 2: the game had become so bleak it was hard at times to care what happened. By focusing on a close-knit, mostly trustworthy family, instead of a group of random survivors who spend most of their time in conflict, it feels like there’s more at stake. There are even a few laughs to be had alongside the heartwarming moments. Don’t let that fool you, though; Telltale still know how to punch you right in the gut, as the very end of the episode expertly demonstrates. As good as it is to see AJ, the flashback sections in this episode leave a lot to be desired. One addition that’s interesting in theory, though flawed in execution, would have to be the flashback sections, which serve to explain exactly what happened to Clementine and Javier before they met. While they’re well-paced and do a great job of informing the player of the character’s personalities and motivations, they’re also the least interactive points of the game. In a series that defines itself by allowing players to influence the story through their own choices, there really aren’t any choices to make in these sections, and Clementine’s flashback, which establishes what she’s been doing since the last season, has no choices whatsoever, instead being just a “mash Q to fight” combat section. Also, while Clementine’s flashback does take into account your final choices from Season 2, she always ends up in roughly the same place anyway by the end of the first flashback, with the one lasting change being that she’ll have a different minor injury depending on what choice you made. Visually, though, this is probably Telltale’s prettiest game, likely due to the decision not to support last-gen consoles. Character models, while still cel-shaded, are smoother and more realistic, and the lighting is much more dynamic. Everything’s also much more colorful, in contrast to the mostly drab, brown and grey palette of previous seasons. It’s also one of Telltale’s smoothest-running games. While you can almost reliably expect something to go wrong in a Telltale game, almost amusingly so, like poledancing Bigby or Batman’s fight with a floating set of eyes and teeth, the only glitches I ran into were a few very minor missing textures, which I could only notice in very small areas, like an small patch of shirt or a bite mark from a walker. Also, it runs very well on all PCs, even mid- or low-range ones. Better visuals also mean more detailed zombies. In terms of overall gameplay, this episode isn’t all that interesting. While puzzles have never been the main focus of the series, the one puzzle sequence in this episode not only lacks any challenge, it’s over in less than five minutes. It’s also incredibly simple. Gathering gas from cars in a junkyard barely counts as a puzzle — it’s just busy work. Previous seasons had simple puzzles, but they required a either a variety of different tasks, such as starting up a train by fixing its parts and clearing debris, or some contemplation from the player, such as deciding who to give rations to when you don’t have enough food to go around. Going up to different cars and doing the same task for each one, on the other hand, isn’t a particularly thought provoking or interesting puzzle. The Ties that Bind Part 1 is also way too short, even by episodic game standards. I finished in just over an hour, and that’s with some fairly extensive exploration as well. While it may just be because they released the first two episodes side-by-side, that’s still an inexcusably short amount of time, even if it does feel tightly paced and concise. Hopefully, the next episodes are at least twice as long, or this will be Telltale’s shortest game yet. The Ties that Bind Part 1 is a great start to a new entry in Telltale’s excellent series, one that does just enough to feel fresh.